These days are hectic; upcoming Orchid Congress in Singapore, preparing the garden for the upcoming tourist season and a constant eye on the clouds, also at night. Some rains during the past few days. No problems since we are well prepared. The birds also seem busy. Many migrants from the north make a stop at Dokmai Garden. Currently we have many white herons, both Great Egret and Intermediate Egret. The Chinese pond-heron is funny. It looks like an old brown folded leaf of a propeller tree (Dipterocarpus tuberculatus) from a distance, but when you get close he would suddenly unfold his snow-white wings and the leaf flies away. A perfect camouflage now in the winter season. We also had a visit of the Black eagle. It is a resident, presumably quite uncommon but since our eagle lives nearby we see him now and them. All black with a long tail, and he usually flies low. Right now he looks a bit shabby. Like our chicken and guinea fowl, being constantly wet puts your feathers in great need for a spa. We have more Hoopoes now during the Chinese winter, although there is usually one or two also in the breeding season. Our frequent visitors will notice that we have recently removed the aviary and released the silver pheasant. The immediate decision was based on the sudden disappearance of the female. Stolen? Python? Cat? We do not know. When the male was released he got into trouble with a stray dog and so he has a limp at the moment. He tends to jump towards me, and I thought it was because he expected food. Yesterday I just passed him and he began jumping after me. I said something impolite about him being a beggar, but then Ketsanee remarked “look, he has plenty of food”. Indeed that morning he was served a constant buffet with rice and clean water. Apparently he just wanted to be near me, feeling protected from murderous dogs and the cocky rooster. I felt guilty and so I wanted to just hug him and comfort him, but I guess he would freak out so I just talked kindly to him. He is a very polite listener. www.dokmaigarden.co.th. [email protected]. Are avocado trees suitable for Chiang Mai? In an earlier article I concluded that in Chiang Mai avocadoes make blossoms already at age three. Then how come that Tops supermarket and Rimping here in Chiang Mai import avocadoes from Australia and sell them at a cost of 45-50 Baht each? It is hard to explain, especially since I picked up gorgeous avocadoes in Mae Sai recently. I paid 100 Baht for 3 kg, and since they were huge I ‘only’ got eight avocado fruits for that price. The locals do sell them immature and very hard, but if you keep them at room temperature (not in the fridge or they will spoil) they will soon mature which you can see by the darkening of the rind. So why don’t we see more avocado in the Chiang Mai gardens? There are at least four reasons. 1. Avocado must have a well drained soil. A few hours of standing water and the roots drown. Yes, plant roots breathe oxygen like you and me. Different plant species have different tolerance, and some like mangrove or lotus grow totally submerged. Avocado is sensitive. When the roots die the leaves lose their turgor and they hang down like rags. The paradox is that the leaves dry out due to flooding! Due to this year’s flooding I guess many Thai avocado trees were killed. Luckily Dokmai Garden was not too badly affected and so three of four specimens survived.Planting it in a slope is good, and so many avocado trees grow in the mountains. 2. Avocado can not stand a prolonged drought. Make sure you can water it during the dry season November-April. 3. One avocado tree is usually not enough. Many avocado cultivars demand cross-pollination between different individuals. If your garden is small (an avocado can reach 20 meters), maybe ask a neighbour if they wish to plant an avocado too, and then both of you benefit. 4. Finally, to the Thais avocado is still something of a novelty. Good cultivars can be a bit hard to find, but if you are not picky simply plant a seed. Yesterday I made a basic guacamole (two huge avocados, three large cloves of garlic, three chili peppers, the juice from one lime fruit and a pinch of salt, all mixed with a mixer). The Thais were a bit reluctant even to try it, but to my great satisfaction they liked it very much. Guacamole is much more healthy than cream-based dips. 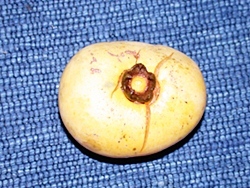 According to Ketsanee, ‘jun’ refers to the moon, because the fruit resembles a little yellow moon. Why not use the English name ‘Moon ebony’ to create an interest for this unusual fruit? Given the recent heavy rains and landslides, I would like to present a few interesting trees which could be used for both preventing erosion and to add beauty. With 1100 wild tree species in northern Thailand there are many options. Unfortunately only a limited number are available. This is mainly due to lack of demand. Land owners who want a forest accept the free governmental teak seedlings (Tectona grandis, Lamiaceae), although a much greater number of tree species are offered, including the valuable rosewoods (Dahlbergia spp., Fabaceae) which are now stolen in the national parks. Since the land owners want a quick cash reward for themselves, they are not interested in making money for their children or grandchildren, nor are they interested in biodiversity. However, if you belong to the vanishing minority of the human population who do care, then you should visit a Thai governmental forest nursery and ask what they have to offer. Some examples: Mai Dhaeng (Xylia xylocarpa, Fabaceae, a beautiul dome-shaped tree with a valuable and durable wood), Takien (Hopea odorata, Dipterocarpaceae, a black-stemmed slow growing species with an amazingly valuable wood and small flowers smelling of honey) and Makha (Afzelia xylocarpa, Fabaceae, a burgundy red wood used for floors. Very sturdy, can stand flooding and droughts). Australian Eucalypts may not be a good choice as they may lower your water table significantly in the dry season. 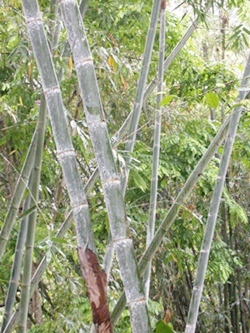 Blue or silver bamboo (Dendrocalamus sericeus) is strong and beautiful, perfect for keeping a bank in position. Beware of its height though, 15-20 m! Chiang Mai has experienced its richest rain fall in a long time. At Dokmai Garden we have so far measured 319 mm in September, which is 69 mm more than the average measured at Chiang Mai airport. This equals three additional heavy rains compared to the average year. Yesterday in the morning we received 48 mm in just 90 minutes, resulting in closed roads, schools, train stations and even some casualties. Dokmai Garden is well fit to cope with this although a current visit demands good foot wear due to the soggy conditions, but it is green, and I discovered a new wild orchid yesterday, probably another Cymbidium aloifolium. I think the origin might be our ancient mango. I do not know what is up there. 1. Do not cut down all trees. Trees bind the soil. 2. Chiang Mai is full of quarries to trap water for the dry season. This is good and a tradition since the first Thai speaking people arrived in the 13th century. However, do not plant trees in the slope only. The weight of the rains may make them fall down as their roots are gripping a jelly-like soil only. Plant some trees 5-10 meters before the edge of the quarry. 3. An excellent erosion control is bamboo. Bambusa vulgaris, the golden variety, forms a thick root system. The culms are very tall though so beware of roofs and power lines. Smaller species might be more useful in such conditions. I have already been asked to put together the outlines for producing bamboo commercially. It is a clever thought as everyone in town will start thinking about soil erosion now. Unfortunately I am too busy with the orchids. 4. Avoid heavy dripping. Let the ground vegetation grow tall in August and September to reduce the power of the rain drops battering the soil. Add leaf litter (do not burn it) which also reduce the power of the rain drops. The leathery leaves of propeller trees (Dipterocarpus spp.) are perfect. This is especially important if you repair damaged soil. Remember, rain can make holes even in stones.